If you missed part 1, check it out, here! When I first bought my T@b, I looked into solar and people recommended that you know should how much power you will use before you purchase your solar set-up. They were right. The problem was, I had no idea how much I might use. To be honest, this type of advice might be just a little overwhelming for the average new RV owner. It was for me. There was so much to learn that I just didn’t have the bandwidth to learn about my power usage and all of the language associated with batteries and solar, at the time. Fast forward almost 2 years and now I understand my battery consumption I lot better. So, before you get overwhelmed, kick your heels back and let me share with you my recommendations for figuring out your power needs. As a reminder, you want to be sure to remember that your T@b battery should never drop below 50% to protect your battery’s health. I use a Victron battery monitor to help me keep track of my battery health. This monitor features the ability to set an alarm to warn you when your battery status has reached the warning level that you select. You can read more about my monitor choice and the installation, here. You can also opt for a low-budget battery monitor that plugs into the 12v outlet in the T@b. This style is not as accurate and does not have the extra features that an advanced monitor offers, but for many, this will be more than sufficient. First, how much dry camping will you actually do? Where will you camp? Are you mostly camping at state parks, COE campgrounds, or Forest Service campgrounds that have electric connections? If so, you might not need to worry about your power consumption. Many T@b owners primarily camp at locations that offer electric. If that’s you, that’s great. You don’t need to worry about how much power you use, your battery capacity, or solar. Proceed to the nearest campground and enjoy! If you do camping without hook-ups, it might take you a number of trips to determine how much power you want to consume. Don’t award yourself a merit badge for depriving yourself of using something that requires power that makes your camping experience more enjoyable. What matters is what makes you comfortable. If you spend your evenings outside at the campfire until bedtime and are gone all day, and you are only making short trips, you might not need to worry about power, either. But, if you like to turn the TV on for a couple of hours and run the fan, you have a different situation on your hand. I want to be able to boondock for 5 days, or so. I want to be able to do this without having to give up using all lights and appliances and I live in a part of the country that has frequent consecutive days of cloud cover, so I cannot always depend on solar to completely recharge my batteries. Below, I have embedded a T@b power consumption worksheet. The power draw is based on either the manufacturers manual or my own testing. Your usage may be different, particularly when Pleasant Valley changes light fixtures, the Jensen model, or if they change other appliances. Putting this worksheet together really gave me a better grasp on how much power I wanted to use. It gives me the knowledge of what I can and cannot do when I am planning my trip. I can also take this worksheet and examine it mid-trip and make adjustments as necessary, to extend my battery life. You can scroll through the worksheet, switch tabs, and enter your own data into the cells below. 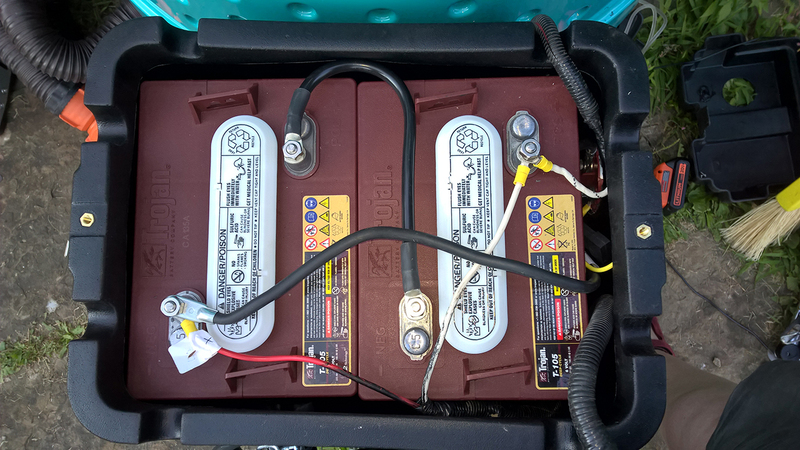 If you notice, there are tabs for 100ah and 250 ah batteries, 2 of the more common batteries set-ups found in RVs. This part is the part that led me to decide to upgrade to two 6v golf cart batteries. I had done a little research. The feedback I read indicated that the golf cart batteries seemed to last a little longer, give you more battery life, and allow you to spend more time off-grid. In the end, I chose two Trojan T-105 batteries for their stellar reputation in the RV community. The screen capture below shows how quickly you deplete a 100ah battery. I have color coded so that you can see the battery status depletion clearly. Having this data also allows me to plan for solar. 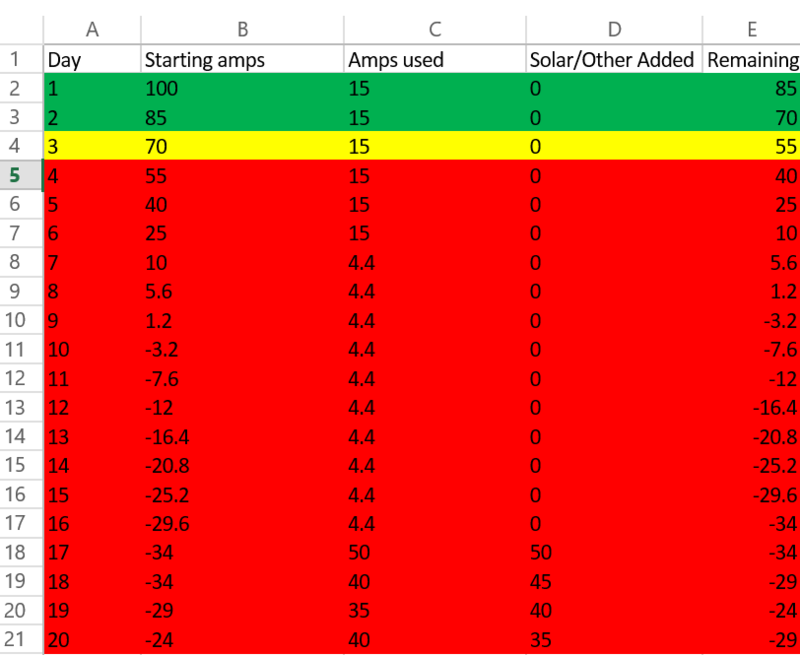 Once you finally know how many amps you will need per day, you can use this calculator to determine how many watts of solar you want or need. I have a hodge-podge solar set-up with several small panels connected, totaling 170w. My plan is to replace this set-up with two 100w semi-flexible panels and an MPPT controller at some point. I believe it will be more than adequate for my use in the T@b and give me a fair amount of latitude for power use, even under cloudy skies. Camping is fun! Take your time to get an idea of your camping style and then make your decisions. I hope you find my lessons learned and the power consumption worksheets useful and that you feel some of the pressure to understand your power usage relieved and keeps you from being caught with the lights out! Remember, I am just a T@b user. 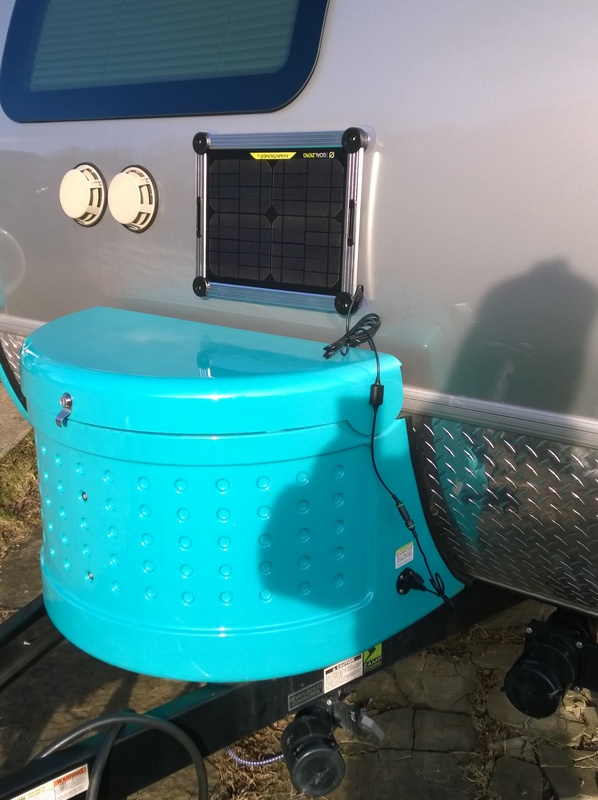 I am not an electrical engineer, an RV expert, or a solar expert. Follow my advice at your own risk. Always defer to manufacturer safety information. 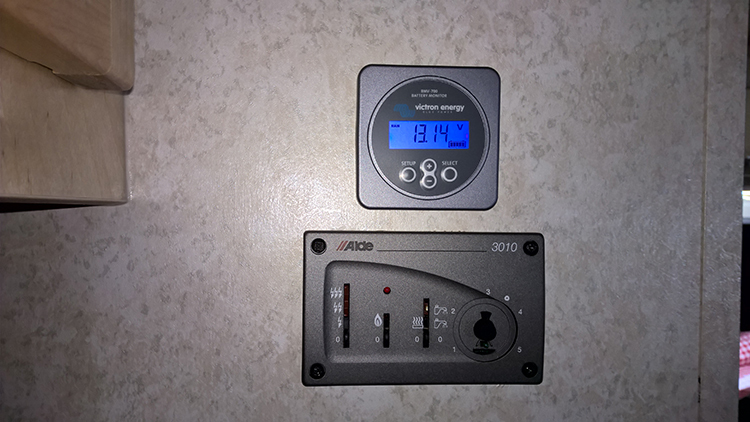 This entry was posted in Power Management, Solar, T@b and tagged battery, power, solar, T@b, trailer.